PALM BEACH, Fla. – April 6, 2018 – Barrett-Jackson, The World’s Greatest Collector Car Auctions®, will once again see charity take center stage at its upcoming Florida event, including three special moments scheduled on the auction block at the 16th Annual Palm Beach Auction, April 12-15 at the South Florida Fairgrounds. Highlighting the week are two charity vehicles, a 2006 Ferrari F430 Spider (Lot #3000) previously owned by Zac Brown Band fiddler Jimmy De Martini – with 100% of the hammer price benefiting Zac and Shelly Brown’s non-profit Camp Southern Ground – and a 1988 Chevrolet Corvette 35th Anniversary Edition (Lot #3001) benefiting the American Heart Association as part of Barrett-Jackson’s Driven Hearts campaign. The 2006 Ferrari F430 Spider, set to cross the block at approximately 5:30 p.m. on Friday, April 13, was originally a personal gift from Zac Brown to De Martini. Vehicle Vault in Parker, Colorado, then acquired the car with the express purpose of supporting Camp Southern Ground, whose mission is to provide extraordinary experiences for children to recognize and magnify the unique gifts within themselves and others to profoundly impact the world. 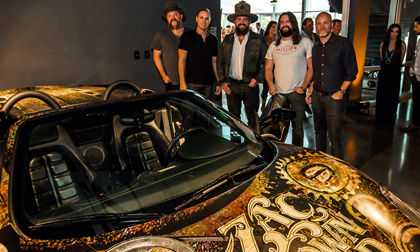 The supercar is powered by a 4.3-liter V8 engine with automatic transmission and features a custom wrap created by the Zac Brown Band design team that co-brands Zac Brown Band, Camp Southern Ground and Vehicle Vault. The Driven Hearts Corvette, benefiting the American Heart Association, is scheduled to cross the block at approximately 5:30 p.m. on Saturday, April 14. The vehicle was auctioned twice in an incredibly emotional moment during the 2018 Scottsdale Auction, helping raise $350,000 at the auction. Prior to crossing the block in Palm Beach, it will be staged with a matching 35th Anniversary Corvette, which was donated by Charmaigne and Darrell Pullen to be auctioned at a future event to support the Driven Hearts initiative (story). The 2018 auction will feature Driven Hearts signage throughout the event, and Craig Jackson’s specially wrapped Bugatti Veyron will also be displayed on-site to help promote awareness. Additional information on Barrett-Jackson’s yearlong Driven Hearts initiative can be found at DrivenHearts.org. In addition to the numerous charity related events during the auction, there will be a special presentation at 2:30 p.m. on Thursday, April 12, on the Barrett-Jackson auction block by Wounded Warriors Family Support (WWFS). In partnership with the Military Order of the Purple Heart, WWFS will present Retired Captain and Purple Heart recipient Tommy Clack – who lost his legs and right arm, and was initially declared dead on the battlefield, during a 1969 attack on his U.S. Army unit during the Vietnam War – with a special mobility-equipped Ford F-250. The truck traveled the country for four months during the WWFS High Five Road Tour, which encouraged Americans to show their support for military families by visiting events and signing the vehicle with a message of support for our country’s veterans and their families. The sold-out Vehicle Docket for the 2018 Palm Beach Auction, along with additional event details, are now available at Barrett-Jackson.com. For more information on becoming a bidder for the 2018 Palm Beach Auction, including the John Staluppi Cars of Dreams Collection and the South Florida Collection, follow the link to www.Barrett-Jackson.com/bid.